​and explores his unique realizations of the Divine Feminine. The Supreme Mother is the Living Heart of Existence. Please join us in our workshop where we will explore and deepen in communion with the inherent Love Embrace and Bliss Intoxication of the Mother. The result of this greater Divine Intimacy will deepen our experience of joy, peace, and happiness in our everyday lives. The theme for the Friday night sitting is "The Field of the Supreme Love of the Mother." 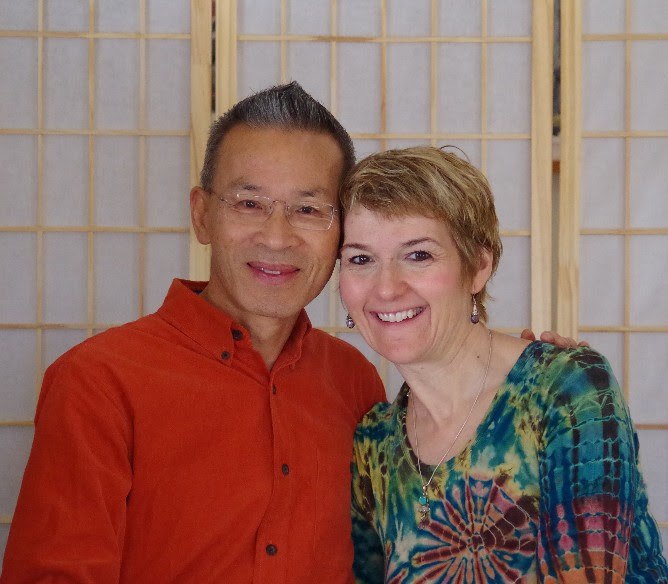 Van Nguyen is currently the most senior (chronologically) Senior Teacher of Waking Down. He was born in San Francisco on March 5, 1951, and believes that he is one of the earliest Vietnamese to be born in America. After enduring a difficult childhood, he began his active spiritual-seeking in college, which led to deep explorations of numerous spiritual traditions and teachers over many years, including Adi Da, where he originally met Saniel Bonder, the founder of Waking Down. After Saniel had established his own teaching work, Van went to see Saniel at his Sunday sitting on June 26, 1995. At that point, Van believed that he was a spiritual failure, but much to his surprise, during this first meditation and gazing session with Saniel, the embodied feeling witness consciousness became awakened in him. Van dove into intensive work with Saniel, through sittings and private sessions with him. (He also did adjunct work with two of Saniel's spiritual teacher colleagues, a husband and wife team, also teaching in a similar manner at this time.) Through transmission and Grace, and again much to his surprise, Van had his Second Birth awakening on August 11, 1995. Van continued to study and apprentice with Saniel, and after sufficient maturity, he began doing spiritual teaching work in January of 1996. Working closely with Saniel, Van assisted many of those who would eventually become the first early group of Waking Down teachers, with their Second Birth awakenings. Over a 20 year period, he has witnessed, and helped shepherd, the development of Waking Down from those early days until what it has currently evolved into today, including the newly renamed Trillium Awakening Teachers Circle. It turns out that after the initial Second Birth (or Heart-Realization), continued deepening and evolution of the basic awakening into more mature and advanced stages unfolds over time. Thus, Van continued in his passion to explore the process of the highest and fullest realization and to deepen his own realization. He continued to engage in ongoing post-awakening "graduate school" studies, which included ongoing studies with Saniel and other spiritual teachers. Since Van's spiritual make-up includes both the "discriminative sage", as well as, the "devotional ecstatic mystic", he delved into understanding and advancing Heart-Realization from both perspectives. He would immerse himself into the unfolding profound spiritual experiences and states, and then afterwards, he would attempt to explain what had happened and to eventually create a "working map" and new expanded dharma for the more advance stages of Heart-Realization. Van's interest in old and new dharma goes back to the earliest days of Waking Down. He was known as the unofficial "dharma guardian", in the early days of Waking Down, due to his keen discrimination about the details of dharma of Waking Down and other schools. In the area of devotion, in the summer of 2000, Van's devotional side got more deeply activated through the spiritual transmission initiation of David Spero, a fully Heart-Realized teacher, in the Divine Mother lineage. In David's sitting, the Divine Love-Bliss and the Divine Shakti Spirit-current were intensified, which resulted in Van experiencing the "intoxication" of a pronounced spiritual ecstasy. In the days that followed, magically, he felt like he was in-love/Love, with no particular person/object that it was directed towards. In the ensuing 15 years, this Mother-based transmission and Van's ongoing work with David Spero have helped catalyze and accelerate the development and enjoyment of the advanced stages of Heart-Realization. Van is eager to help guide other receptive people into Heart-Awakening, and then continue further with the post-awakening recognition, evolution, and growth into the more advanced stages of Heart-Realization. Additionally, he would like to help map out these stages, in order to innovatively expand the current Waking Down dharma and cosmology - both within the context of the Trillium Awakening Teachers Circle and beyond - for aspirants/realizers now and for those future generations yet to come. Lynn believes she was born with her heart open, leaving her vulnerable to life’s events. After a lifetime of spiritual seeking and awakening, a further heart flowering occurred when she was visiting a temple in Kauai with Van last fall. It was during a deep meditation her heart opened wide and she began hearing beautiful poetry as profound Mother love moved through her heart. It was like the Mother was taking divine possession of her heart and speaking love intoxicating sublime words describing her heart mission in this life. She saw and felt her heart as a gigantic flower filled meadow of supreme love in which it could hold all of humanity and it’s suffering. Lynn is deeply grateful for such transformative grace and heart awakenings in her life and is overjoyed to share this Divine love with other.